From Saipan, Commonwealth of the Northern Mariana Islands. June 2010. 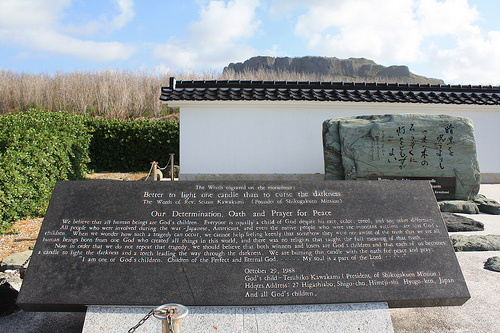 A series of Japanese Peace Memorials at the Suicide Cliffs where hundreds of Japanese civilians and soliders jumped to their deaths in WWII. this is a quote from Teruhiko Kawakami, of the Shikogakuen Mission, who calls himself "God’s Child."